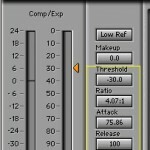 Tags: Kick drum recording and mixing techniques, Snare drum production techniques. 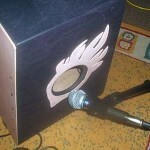 This post illustrates a method on how you can record a cajon or acoustic drum box. 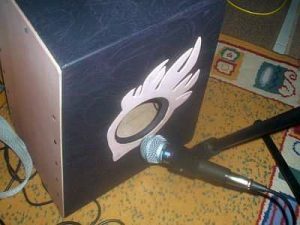 To further illustrate the complexity; consider an acoustic live band scenario where the cajon is recorded together with other musical instruments such as a bass guitar. 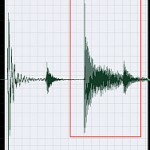 The recording can be challenging if the aim is to capture the natural punch and sound of the drum box to your DAW. 4.) SM58 dynamic microphone for micing the cajon drum box. One important technique here for sound quality is to use a power amplifier which will handle all incoming music instrument level signals. These signals are then feed to the Saffire Pro40 audio interface via the condenser microphone. For example in the above screenshot; the power amplifier used is Laney AH200. This amplifier can also handle all types of signals whether coming from a bass guitar, acoustic/electric guitar, keyboards, drum box, vocals, etc. The good thing is that most live venues do include a power amplifier cabinet. 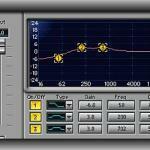 Also one big advantage is that you can apply individual EQ and effects for each music instrument with Laney AH200. In this setup, you won’t need a hardware mixer in your home for the live recording. On the other hand; Laney AH200 can accept up to six individual music instruments in the line input. SM58 dynamic microphone is used to capture the natural sound of the cajon acoustic drum box. Some drum box does include a line out circuitry which will be feed to an amplifier or something. But I do not recommend using this for recording because it cannot capture the natural sound of the cajon drum box. Do not place the microphone inside the hole because it cannot capture the ambiance and natural reverberations of the room. 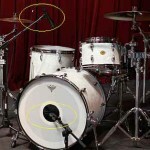 In addition, placing it very far from the hole can decrease the punch of the bass drum sound.